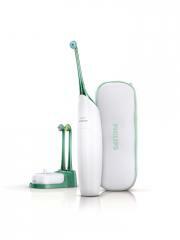 Philips Sonicare AirFloss HX8255/02 allows an easy cleansing between the teeth, in only 30 seconds. AirFloss has been clinically proven to provide healthier gums in just two weeks. In order to process to the cleansing, simply fill in the Philips Sonicare AirFloss HX8255/02 with mouthwash or water in the handle tank to position the guide tip, and press the button to put the device in operation. Interdental cleansing is done by microjet of air and water. By gently removing the dental plaque that brushing could not remove, the Sonicare AirFloss prevents cavities from forming between teeth. The guiding tip and the fine, sloping cannula allow easy positioning. Simply slide the tip over the teeth along the gumline until it meets an interdental space. Designed to be easy to use in small spaces, AirFloss has a comfortable, non-slip ergonomic handle. Its autonomy is two weeks. A light flashes when the battery needs to be recharged. Pour mouthwash or water into the handle tank, position the tip, and press the button. The tank can hold enough liquid for two uses. Safe for orthodontic appliances and dental restorations. Indication: Interdental cleansing. To remove the plaque where the brush does not pass.